Poached eggs and streaky bacon are always a great way to start the day, but sometimes what you really desire and hope for is a crunch of sweetness first thing in the morning just like when you were a kid. Grownups have every right to eat a bowl of cereal for breakfast too, only we want it in adult-approved versions made from wholesome ingredients. Paleo granola is sure to appease any sugar-coated cravings with a delicate amount of honey or maple syrup. The almonds, walnuts and rich macadamia nuts are what make this crunchy Paleo granola a bowlful of long-lasting energy. Macadamia nuts are special – they are extremely low in Omega-6 and higher in monounsaturated fat, just like in avocados and olive oil and, surprisingly, they can reduce inflammation. You can even use them in place of pine nuts for the creamiest pesto you ever sunk your teeth into. 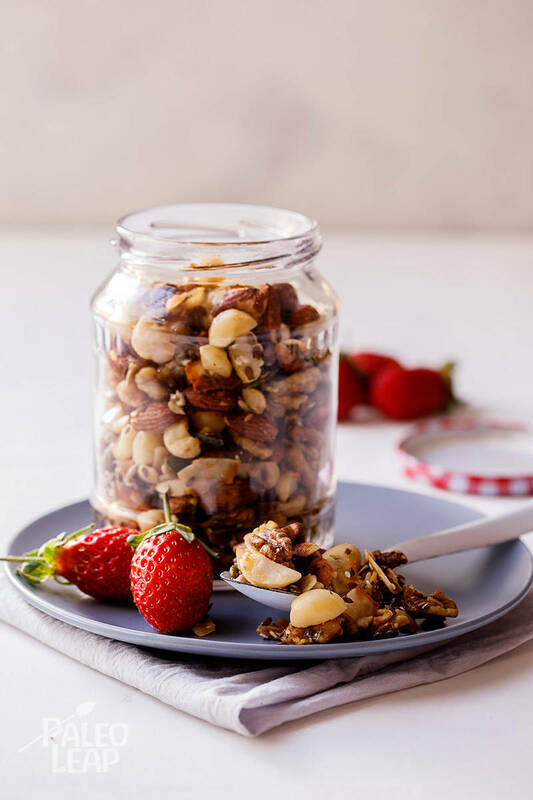 Never claim that nuts are boring just because they are plain, it only takes one time of making your own Paleo granola to release their/your unlimited potential. If the idea of downing a smoothie for breakfast on the run has you hiding under the covers, or sprinting to work, know that the first meal of the day is essential – for your wellbeing and for the wellbeing of others. It helps to keep us balanced throughout the day, so don’t skip it! There are many Paleo-approved egg-free breakfast options to ponder upon waking up, but if you need something crunchy to start the day, then we highly recommend sprinkling this crunchy granola over your favorite coconut yogurt, or simply mix it in a bowl with some cut-up seasonal fruits. Pure bliss! Melt the coconut oil, honey, salt and vanilla over low heat. Combine all the nuts and seeds in a large bowl and add the coconut mixture. Mix until everything is well coated in the oil. Transfer the granola mixture to a greased baking sheet. Place in the oven and allow to bake for 10 minutes, keeping an eye on the mixture as it can easily burn. Remove from the oven and allow to cool, then place in an airtight jar and keep for up to 2 weeks.